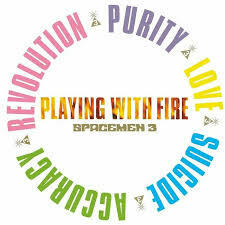 Originally released in February 1989 and after having been out of print on vinyl for nearly 20 years Space Age Recordings are pleased to announce an official vinyl release of the third and penultimate studio album “Playing with Fire” by Spacemen 3 (Sonic Boom a.ka. Peter Kember (Spectrum / E.A.R.) and Jason Pierce (Spiritualized). Featuring the single “Revolution” first released in November 1988: “one of the best records released by an independent band this year. Adjectives that come to mind are unrelenting, punishing, psychedelic. The razor-blade riffs lead you into a sonic underworld of alienation, desolation and raw power…the band are one of the most interesting around. — Ron Rom, NME. “a powerful, anthemic “mind-melting crunch” (Ned Raggett, AllMusic).